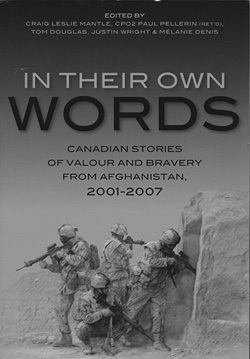 In Their Own Words: Canadian stories of valour and bravery from Afghanistan. 2001-2007, edited by Craig Leslie Mantle, CPO2 Paul Pellerin (Ret’d), Tom Douglas, Justin Wright & Mélanie Denis [Canadian Defence Academy Press, 2013], vividly presents the personal accounts of twenty-three Canadian soldiers who have been recognized with some of the nation’s highest honours for their courageous actions in Afghanistan between 2001 and 2007. This groundbreaking book offers profound insight into the daily challenges faced in the field, the hazards of combat, the trials and rewards of military service, and the “mind of the soldier.” By recounting the circumstances under which he earned his decoration, each recipient, in his own voice, provides a positive example of the many values that the Canadian Forces itself cherishes: duty, loyalty, integrity and courage. Whether engaging the enemy, saving the life of a fellow soldier from certain death or preventing civilian casualties, the experiences recounted within these pages are nothing short of inspiring and deserving of the highest possible respect. For I am a Canadian soldier. Ambassador of the “Red Maple Leaf”. Fought for us long ago. The most precious of gifts. Freedom to love and express art. Freedom to be who you want to be. Freedom is a package deal. With it comes responsibilities and consequences. Do not make our sacrifice, one in vain. I fought for my fellow man’s freedom. Yours to carry on in memory. And criticism of our mission arises. Visit my new page, In Praise of Canadian History: A bibliography of interesting Canadian books and authors, and facts you may not know about Canada..